Scott E. Bartner was born in Washington, D.C. in 1960 and grew up in the suburbs of Bethesda, Maryland. Despite growing up in an artistic household, Scott never gave the slightest indication of the direction his career would eventually take. In fact, it wasn't until his sophomore year at Rutgers College, where he was studying economics, that he received his first exposure to art history in a course taken more on a whim than with any real intention of studying the subject seriously. Because of the nature of the courses (two automatic slide projectors were often used in rapid succession), he began to make quick sketches in a notebook of the images appearing on the screen, simply to remember which painting the professor was referring to. After college Scott went directly to business school, earned his Master's degree, and soon found himself working as a financial analyst in a large bank. The work was dull, the environment oppressive, and in this setting he started to draw. His father, then Chief of the Medical Illustration Department at the National Institutes of Health, showed him the basics of drawing and form. Scott married a Dutch woman in 1987 and together they decided that, if he could find employment in the Netherlands, they would move abroad. He stayed in his wife's native South Limburg during the rainy autumn months, beginning his first portraits using pastels to fill the time. Failing to find work, Scott returned to Bethesda in 1988 where he resumed his career in finance, this time with a real estate investment trust. During this period, he began his first copies of old master drawings, drew from models at a local college and received his first lessons in oil painting from an artist and colleague of his father, Al Loang. 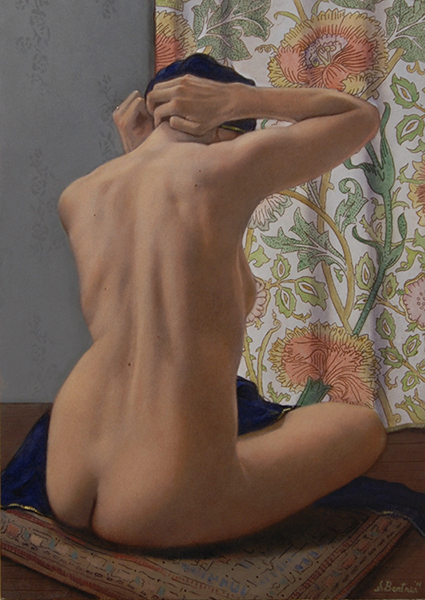 Scott later took drawing and painting classes at The American University and was encouraged by his teacher, Ruth Stroik, to continue his studies. A turning point in his artistic development was a three-week trip to Tuscany with fellow art students, where the works of Andrea Del Sarto, Giorgione, Titian and Caravaggio made a lasting impression. At some indefinable moment Scott's art became his real work and he would cringe when hearing it referred to as a "hobby." After meeting and showing his work to the noted Washington artist and teacher Frank Wright, Scott was advised to study with Danni Dawson, a prize student of Nelson Shanks. Danni set up a rigorous schedule for him in- and outside the classroom, which included making color studies, painting self-portraits and still lifes, and copying a large portrait by Sargent. Scott was hired by the U.S. Treasury Department in 1989. This was to be his last financial position in America. He spent his lunch breaks in the nearby National Gallery of Art, studying the old masters. In 1991, his wife was offered a position in the Netherlands and Scott finally saw his dream of living abroad come true. He found employment with a pharmaceutical company and studied in the evenings with the Dutch artist Maarten Welbergen in Amsterdam. From Maarten he learned a traditional painting technique that suited his nature and way of working. When his contract ended, Scott decided to put an end to his business career and to paint full time. In 1993 he moved to Maastricht, where he established himself as a professional portrait painter. Since then he has received numerous portrait commissions throughout Europe and the United States. Scott currently resides in Maastricht with his second wife Marianne. Notable portrait commissions in The Netherlands include Mr. F. Barge and Mrs. C. Dreesmann-Barge, Mrs. A. van Beuningen-Ferrier, Mrs. H.J. De Graff-Hesselink, Bisschoppelijk Vicaris van der Meer SJ, Mr Z.F. Baron van Dorth tot Medler, Mr R.H.M.J. Baron van Hövell tot Westerflier, and Mr J.M. Saleh, former Governor General of the Netherlands Antilles.